more intense storms to threaten water infrastructure and increase polluted storm water runoff. Austin American Statesman - LCRA raises water, wastewater rates - The Lower Colorado River Authority on Wednesday approved rate increases for wholesale water and wastewater that will affect residential and retail customers in Williamson, Travis and Hays counties. 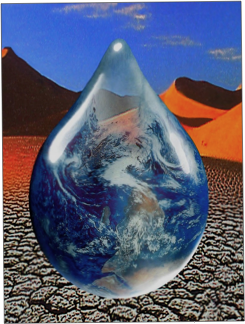 Environmental Network News - Spain's drought a glimpse of our future? - Barcelona, Spain is a dry city. It is dry in a way that two days of showers can do nothing to alleviate. The Catalan capital's weather can change from one day to the next, but its climate, like that of the whole Mediterranean region, is inexorably warming up and drying out. Its fountains and beach showers are dry, its ornamental lakes and private swimming pools drained and hosepipes banned. Children are now being taught how to save water as part of their school day. Spain needs to capture more rainwater, says Stephanie Blencker of the Stockholm International Water Institute, as climate change will produce alternating extremes of drought and heavy rain. "Rain is the biggest resource we have, and we can make it available all year round if we have sensible storage opportunities," she said. Bexar County 4-H helped retrofit 364 toilets to conserve about 4.3 million gallons per year.The Valencia Homeowners Association helped retrofit 319 toilets for a savings of 3.8 million gallons per year. The 2008 WaterSaver Pioneer Award went to SeaWorld San Antonio. The 250-acre marine park has invested in numerous water-saving measures, including an extensive water-recovery system for all marine pools, ice-plant water reclamation for cooling, operating decorative fountains and watering hanging plants with captured air-conditioning condensate, planting and maintaining drought-tolerant landscaping, and retrofitting high-flow toilets at the park. Through these measures, SeaWorld saves more than 25 million gallons of water per year.